You need tailor? You want suit? Copy watch? Copy handbag? You will understand once you take a stroll down Nathan Rd. yourself! Today was our first day in Hong Kong and we had one goal: to get lost. After our morning americano at the café near our apartment we started walking, and walk we did! 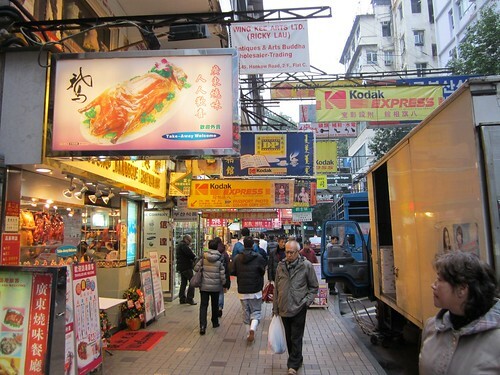 We headed down Nathan Road, a popular street in the Kowloon area. Since we are staying in Mong Kok, we walked south towards the Pier to view Hong Kong Island. Without specific plans or a timeline, the colors and smells quickly took us far from Nathan Road, completely overstimulated, in the best way possible. We would follow one street to a new smell, and then a colorful sign overhead would lead us down the next block. It was a maze with no end. The scents are around every corner. If you aren’t hungry when you leave your apartment you will be when you start sniffing. 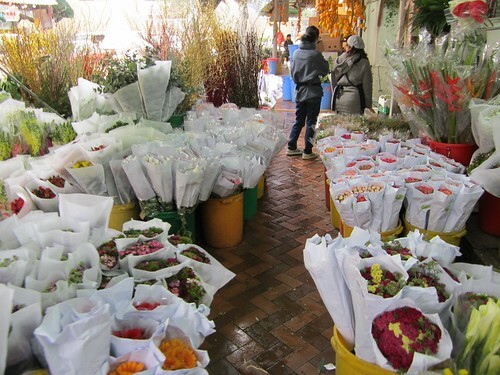 We are staying in the flower market, and once we step outside we are surrounded by hundreds of every type of flower you could imagine covering the sidewalk. The air is intoxicating. We keep walking and the first shop is Uncle Fong’s, a bakery that has the sweetest smelling delicacies. We managed to walk by without buying anything in the morning but the scent stayed in my mind all day and we ended up picking out our own treat by the end of the day. 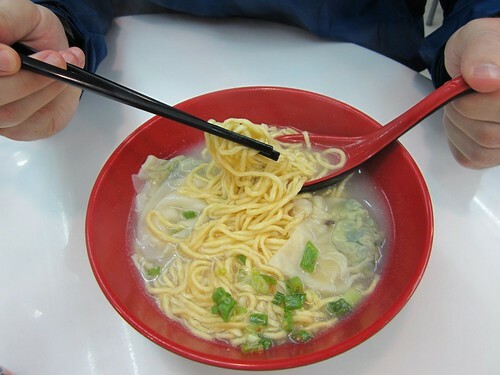 It is no secret that people in Hong Kong appreciate their food. The street stalls have hordes of people quickly grabbing food that I cant even begin to recognize. Although most of it is most likely something I would prefer not to try, the smells intrigue me and draw me in. You walk by the sweetest smelling bakery and it is quickly followed by a foul smelling sewer. It is the city and I am loving every minute! As mentioned above the smells are strong and enticing. I still wonder exactly what I am eating, but I am willing to eat now and ask later. We want to try new things and be adventurous with our food choices. Yesterday we ordered some type of meat wrapped in bacon and it was deliciously salty. We try to pay attention to what the locals are eating and try that but really everything looks fabulous. You can’t walk one block without seeing a restaurant, food stall or bakery selling something you want to eat. We are constantly reminding ourselves that this is a marathon, not a sprint and the food will still be there tomorrow! Massive crowds of people are everywhere and for someone who makes a hobby out of people watching this is enough to keep me entertained for hours. The dress, the energy and the personalities of everyone walking down the street is fascinating. My eyes are darting all day long across the crowds, studying the great new culture I am in. The language is so foreign to me, my mind is always trying to decode it. Signs are everywhere. They are colorful, big, small, new, old and overlap each other every which way. You are unable to focus on anything in particular due to the number of signs constantly surrounding you. I think I read every single one, and am fascinated by the chinese symbols and the translation to English. As we walked by every shop my mind raced to use the conversion rate and compare their prices to ours back in the states. I’ve lived in a huge city for a few years and have visited many more. Hong Kong is like no city I have ever visited: extremely visually stimulating. Like any city, the noise varies depending on what area you are in. The apartment we are staying in is relatively quiet compared to Nathan Road, but only a few blocks away. We hear the train go by and if there was a soccer game in the stadium across the street we would hear that, but mostly the flower market quiets down during the evening and does liven up during the day but I would still not call it loud. Walking down Nathan Road you hear cars and buses barreling by you and the sound of horns honking in the constant traffic. You hear the street vendors selling their food chatter mostly in Cantonese, with an occasional foreign language that you can’t quite make out. Nathan Road is a street not to miss when you visit Hong Kong. I encourage you to take your time walking down it and experience all the sights, sounds and smells that you will be introduced to. It is a bustling city and a treat for your senses!